A George II mahogany side table circa 1755, valued at £80,000-120,000 ($129,280-193,920), is to lead The English Collector sale at Christie's on November 14. Clearly inspired by the neoclassical designs of early 18th century designer William Kent, the unattributed table belongs to a distinct collection of furniture made in the same workshop. The now-restored table was acquired by the Forbes family, owners of Castle Newe in Aberdeenshire, Scotland, in the 1700s, and features a marbled top above a wooden frieze, moulded with patterns of leaves and berry wreathes. 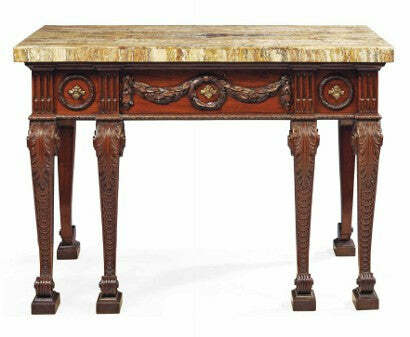 A regency mahogany library desk is estimated to make £70,000-100,000 ($113,120-161,600). The pattern on which the desk is based was commissioned by a young King George IV for Napoleon's use in exile at New Longwood House, St Helena. 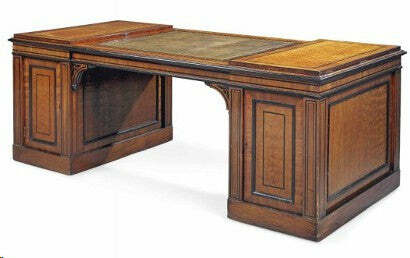 Only two examples of the desk are recorded in mahogany, making it likely that this is the double of the one that was shipped to St Helena along with Napoleon. It has sold on two separate occasions in recent years - once in 1989 at Osmond Tricks, Bristol and subsequently at Christie's London in 1994, where it realised £122,500 ($197,685). A George II mahogany daybed features with an identical estimate of £70,000-100,000 ($113,120-161,600). It was built by Paul Saunders, a pre-eminent London cabinetmaker, circa 1755, according to a design by Thomas Chippendale. We have this George III cabinet built by John Linell, widely regarded as one of the best cabinetmakers of the 18th century. Sign up to our free weekly newsletter for more of the latest on antiques and collecting.